Before you say that this is totally nuts, read through the commentary and take a look at the charts. Then you can say that this is insanity. For a warm up, here are a couple of interesting charts. Notice the tight correlation between the U.S. dollar, Euro and the S&P 500. This is what has been part of the driver for this incredible rally. Of course earnings have picked up substantially as well, but the dollar has a big footprint when it comes to the movement in markets. This is also part of the reason for the wild ride in precious metals. Now, here are a couple of more charts, with a longer time-frame to consider. 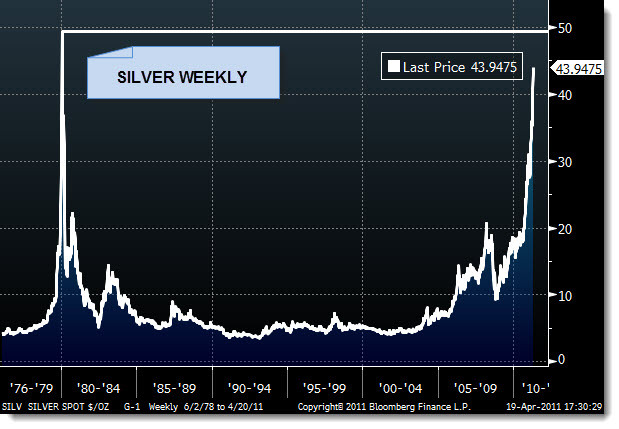 First up is the long-term chart for silver. Back in the late 1970’s, there was a run (similar to what we are seeing today) due to inflation concerns and other speculative activity. The actual flight to silver climaxed when it reached close to $54, then suddenly collapsed. The weakness of the U.S. dollar and the fear of inflation also has a great deal to do with the price movement. The parabolic swing higher is a result of a feedback loop and ease for investors to pile in. 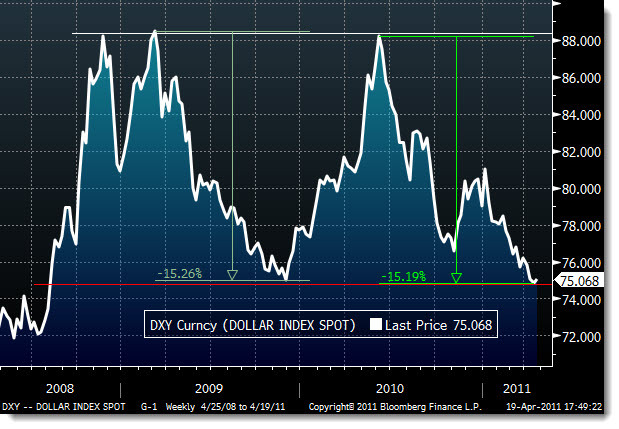 The Dollar has moved considerably since QE (money printing) policies by the Fed. With this in mind, we may have found a spot to enter a short position for silver. The parabolic move is both bullish and bearish for the near-term price. Nelson Bunker Hunt and William Herbert Hunt, the sons of Texas oil billionaire Haroldson Lafayette Hunt, Jr., had for some time been attempting to corner the market in silver. 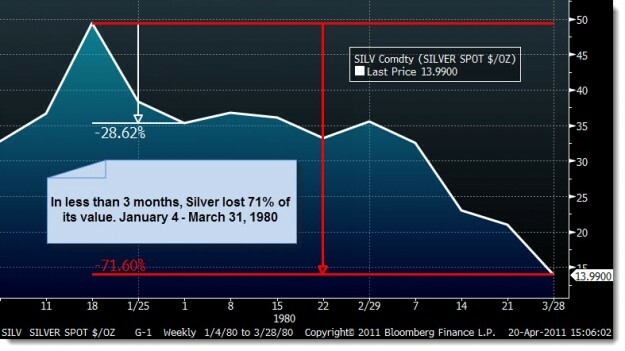 In 1979, the price of silver jumped from $6/oz to an all-time record high of $48.70/oz. The brothers were estimated to hold one third of the entire world supply of silver (other than that held by governments). The situation for other prospective purchasers of silver was so dire that the jeweller Tiffanys took out a full page ad in the New York Times, condemning the Hunt Brothers and stating “We think it is unconscionable for anyone to hoard several billion, yes billion, dollars worth of silver and thus drive the price up so high that others must pay artificially high prices for articles made of silver”. But on January 7, 1980, in response to the Hunt’s accumulation, the exchange rules regarding leverage were changed, when COMEX adopted “Silver Rule 7” placing heavy restrictions on the purchase of commodities on margin. The Hunt brothers had borrowed heavily to finance their purchases, and as the price began to fall again, dropping over 50% in just four days, they were unable to meet their obligations, causing panic in the markets. Is there anything similar sounding in the above story to what is occurring today? Somewhat. 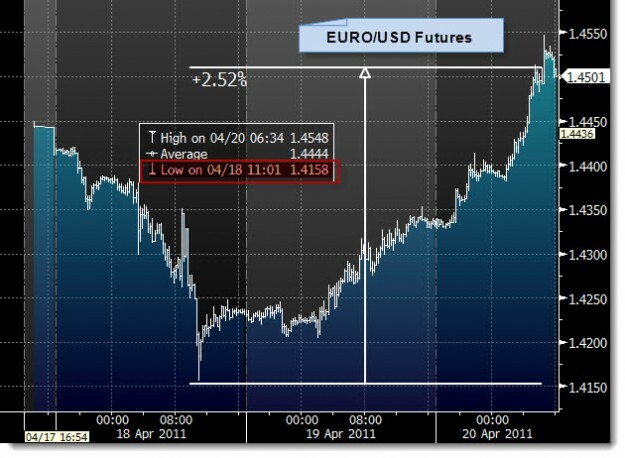 One thing is for sure, there are speculators that are using significant leverage to profit from this massive move. When (if) it unwinds, there will be a bloodbath and the potential for silver to drop rather quickly. In addition, the uncertainty in the world has provided for the potential of a safe-haven run to the U.S. dollar, which is now heavily shorted. Over the next few days and weeks, there is sure to be a discussion regarding the impact of inflation and the budget deficit. Once congress returns, the accusations will fly and there will surely be budgetary plans presented that could have a significant impact on the U.S. dollar. In other words, everyone is on one side of the ship. In the event of a change in direction or sentiment, there could be a tremendous move that will provide for a dollar squeeze and a short cover in silver. 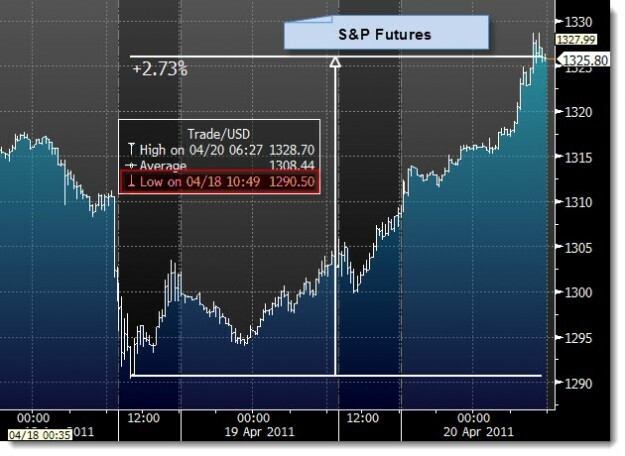 With this in mind, we entered a short position for TDIMG Client Portfolios in silver through an ETF. It provides a good level of exposure and opportunity that inversely correlates to the price movement in silver. Of course if the position moves away from us, we will not let it get to far….